In order to defeat the enemy we must first know our enemy. 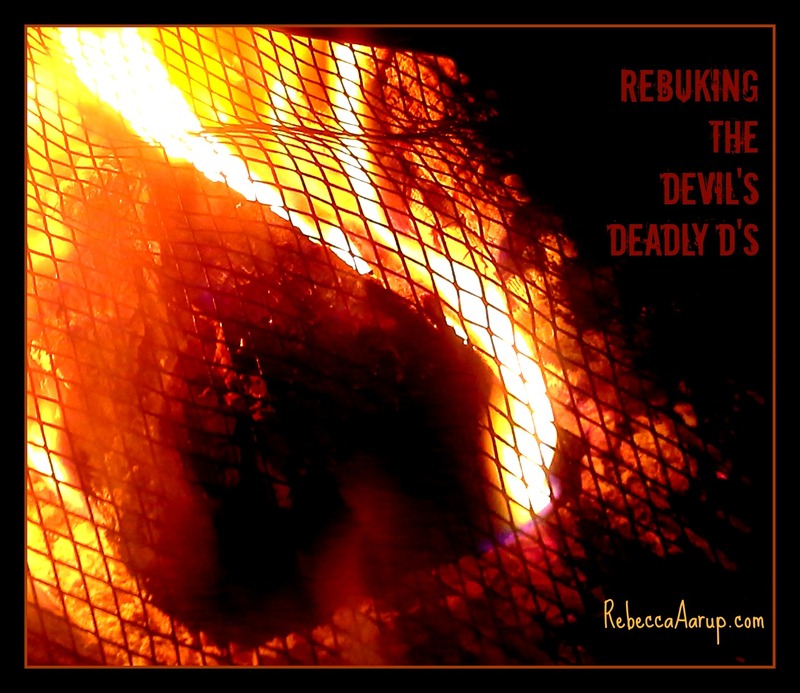 In our last post we studied the character of Satan. Knowing his character will help us understand what kind of thoughts originate from him (or his demons) compared with our own fleshly thoughts and desires. Today we will talk about the various weapons of warfare Satan uses to attack believers. I’ll be using some references from the course I just finished at Liberty: The Doctrine of Satan. In it, my instructor lists the sixteen deadly “D’s” and I’ll be sharing his insights with you over the next several posts. I have no doubt you’ll recognize some of them in your life. What Christian (or human being) hasn’t experienced disappointment? Let’s face it; we all have expectations that are not met. We all have wants and desires that never come to fruition in our lives. Satan loves to capitalize on the demoralizing feelings of disappointment in the believer’s life. If we’re not standing guard with our weapons of war (the Armor of God—see Ephesians 6:10-18) we will be ill equipped to fight through disappointment successfully. When disappointment is left unchecked, it deteriorates into discouragement. It’s important to note that any form of discouragement has its origins in the devil. Discouragement cannot come from God. When we walk around with a sore countenance, griping and moaning about our circumstances, we give over a place of our hearts to discouragement (a spiritual stronghold for Satan to gain ground in our lives), which completely contradicts our New Life in Christ. Not only are we opening the door for Satan, but we fail to display the joy and peace of Christ to a world that needs His hope. Despair is the final result of disappointment and discouragement left to fester in one’s spirit. The despairing believer has no joy, purpose, or peace. I know a lot about despair because I lived a decade of my life in that place. I tried to commit suicide and suffered with addiction, eating disorders, and severe mental illness. It is impossible to effectively serve God or experience the fullness of His presence in such a state of mind. The despairing believer has willfully traded the truth of Jesus for the lies of the devil. The best way to keep these first three deadly d’s from gaining ground in our lives is to recognize where they are coming from (Satan) and fight against it with the Word of God and prayer. It all starts with a little disappointment, so remember—Disappointment is God’s appointment. Give it to Him the moment it occurs and choose His truth over Satan’s lies. How about you? Have you ever seen these deadly d’s take root in your life? What was the end result? What’s the difference between the flesh and Satan? Can Satan’s influence affect children? This is great Rebecca. Amazing. Rebecca, oh how I needed this. And I love the continual comment, “we need to pray out loud.” I talk with God all day long but have finally caught on to the difference in those communications and praying out loud to Him. I’ve struggled (and still struggle) with many of the things you’ve shared here and praying out loud is so necessary for me to fight against the lies Satan tries to fill my mind with. Thank you for your heart and words. Beth, thank you for stopping by my blog and commenting. I just shared this message with my life group this morning and we all admitted we’ve struggled with these areas. Fortunately the truth gives us freedom and we never have to settle for less than God’s best. Keep on fighting those lies! Another excellent post, Rebecca. David sums it up well. I’m intrigued to know what the next 13 ‘D’s’ are: depression, death, disaster, a few guesses. Looking forward to finding & learning them. Ian, those are great guesses but actually none of those are part of the 16 deadly d’s! Although I think depression and despair kind of go hand in hand. Rebecca, I have been following your blog for some time now, and I have watched my little sis in Christ grow so much. I am proud of you and filled with great joy by what our Lord is doing in your life. I guess this is the long way around of saying great post. May our Abba Father keep filling you to over flowing with wisdom and knowledge of His Kingdom, Amen! James, sometimes I forget that you’ve pretty much been by my “blogging” side from the very beginning! Thank you for encouraging me all the way and putting up with bad writing and changing blog designs and all that stuff. You’re commitment to reading anything I write has been the biggest blessing to me. You’ve read more of my heart then even my own family and friends. So glad to be on this journey together, growing in Christ and writing for His glory. Thank you Jesus! Thanks Rebecca. With such a dearth of blogs and perspectives that offer a “balanced” view of spiritual warfare, your blog is important. How else do we challenge the anti-supernatural bias in western culture AND–believe it or not–in the church. Thank you David, your encouragement means a lot to me! Nice to know someone is reading this and “getting it”!